What is the Pacific Crest Trail Campaign? Gus Wimberger, 18, is an outdoor enthusiast who will be graduating from Foss High School in the spring. Elena Wimberger, 22, is an avid adventurer who will be earning her B.A. in Politics with a minor in Spanish from Willamette University this spring. Along the way they’ll be raising funds to support Etta Projects’ initiatives in Bolivia, empowering local communities. Gus and Elena will be attempting to raise a goal amount of $5,326, (one dollar for each mile they hike) in order to fund and support projects, families and communities through Etta Projects. 100% of donations go to Etta Projects. You will be able to see directly where your money is put to use in the communities. 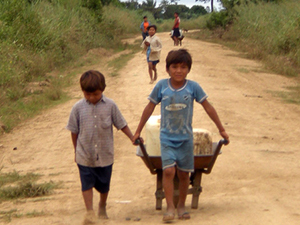 Help make Gus and Elena’s trek meaningful by changing lives of those in Bolivian communities! 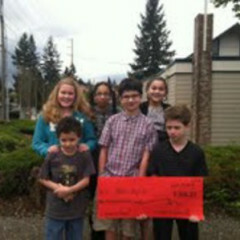 United Church's Sunday school's "Change for Change" Campaign Supports Gus and Elena on their Trek! We are a group of young advocates from the United Church in University Place that raise funds by collecting loose change. Our “Change for Change” campaign was established to support sustainable projects that improve the quality of life in developing countries. We chose to donate to Etta Projects for a number of reasons, namely: it is a local nonprofit; it has sustainable attainable goals; it has good people involved; there is a lot of passion at the annual fundraisers; they listen to the Bolivian people for solutions; there is an emphasis on children and families; and more. We were also really impressed by the adventure of siblings Gus and Elena Wimberger. Gus came to our Sunday school to talk about his upcoming adventure- hiking 2,665 miles, travelling the entire Pacific Crest Trail on foot, in support of Etta Projects’ initiatives in Bolivia. The journey will be long and taxing, but it will be more meaningful as they raise funds to better the lives of those in Bolivian communities. Join our Sunday school group in supporting this duo by contributing towards Etta Projects’ amazing initiatives that empower Bolivians to transcend the limitations of poverty! Etta Projects. Attainable. Sustainable. Results. Empowering Bolivian communities to transcend the limitations of poverty. Etta Projects’ mission is to partner with Bolivian communities to implement sustainable solutions to the challenges of poverty, while educating and inspiring North Americans to act for positive change. Tell United Church why you this cause!